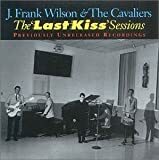 J. Frank Wilson's, "Last Kiss"
Well, where, oh where can my baby be? So that I can see my baby when I leave this world. This version of this song was a little too upbeat/danceable for its own good. When Pearl Jam re-recorded it, it actually did sound depressing, which it's supposed to be (someone dying before their time isn't something to dance to).